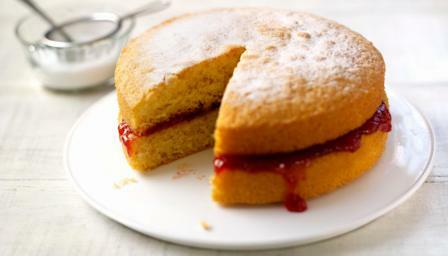 The traditional Victoria sandwich is a baking classic and a tasty tea-time treat. Break the eggs into a large mixing bowl, then add the sugar, flour, baking powder and baking spread. Top with the second cake, top-side up. Sprinkle over the caster sugar.